Boeing and SpaceX are relying on the tried-and-true gumdrop-shaped capsule design as the two companies each develop spacecraft under NASA contracts to ferry astronauts to the International Space Station. LOS ANGELES — In 1961, an American astronaut reached space for the first time and soared through the heavens in a gumdrop-shaped capsule. Boeing and SpaceX are relying on the tried-and-true design as the two companies each develop spacecraft under NASA contracts to ferry astronauts to the International Space Station. The new spacecraft have a number of features that weren’t available on earlier capsules — touch-screen displays, large windows, more powerful electronics and lighter materials. The spacesuits that astronauts will wear also have been slimmed down. 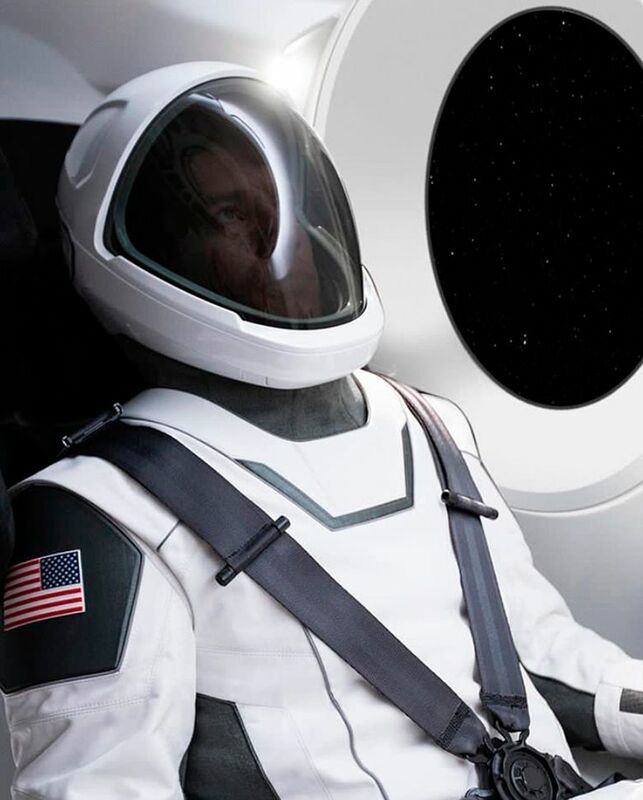 SpaceX has released several photos of its spacesuit, which Chief Executive Elon Musk said was tested to ensure astronauts would stay safe even if the pressure in the capsule dropped suddenly. Boeing’s “Boeing blue” spacesuit is about 40 percent lighter than previous suits, and the gloves were specially designed to let astronauts interact with touch screens. In the early days of the U.S. space program, astronauts lamented riding in anything that allowed for such limited human control. Borrowing the name from something you swallow didn’t enhance the appeal. Initially, there was great enthusiasm for making those spacecraft look like airplanes, but it was difficult to create wings that could navigate various parts of a mission and survive the heat of re-entry, Hersch said. Any spacecraft rated to carry humans has a specific set of requirements. It must be efficient in its volume with enough space for all necessary life systems, but have as low a mass as possible. It also has to withstand tremendous G-forces, pressure and heat during launch and re-entry. The heat shield on a capsule’s blunt, slightly curved bottom helps protect the crew as the vehicle re-enters the atmosphere. Capsules are aerodynamically stable when traveling at supersonic speeds during re-entry and require little maneuvering to return to Earth in an emergency, giving them “inherent stability,” said David Giger, senior director of Dragon development engineering at SpaceX. In creating spacecraft for NASA’s commercial-crew program, both Boeing and SpaceX have built on the example of their predecessors. Boeing constructed its design based on some of the data from the 1950s- and ’60s-era Mercury and Gemini, as well as NASA’s Orion, a crew spacecraft that first flew in 2014 and is scheduled to ride into space atop the agency’s Space Launch System rocket in 2019. The Chicago aerospace giant’s Starliner will blast into space on an Atlas V rocket before deploying and docking autonomously at the space station. When returning to Earth, the spacecraft will jettison its service module, deploy parachutes to slow down and drop its heat shield so the vehicle’s air bags can inflate for a softer ground landing. A version of the capsule is undergoing tests at a Boeing facility outside Los Angeles where space structures for the Apollo program, the original Delta and Delta II rockets and parts of the space station were also cleared before their missions. 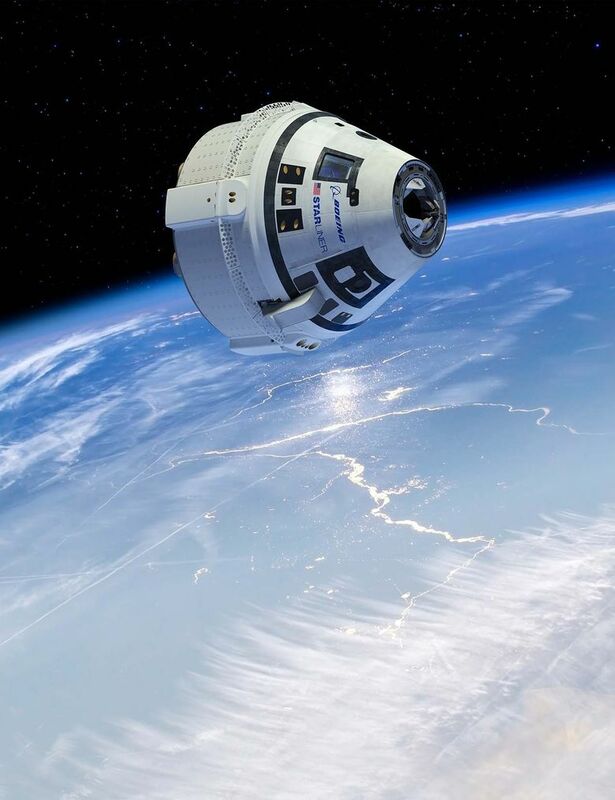 The CST-100 Starliner capsule is set to make its debut test flight in June 2018, with a crewed test flight two months later. One major development is the fine-tuning of the capsule’s heat protection. 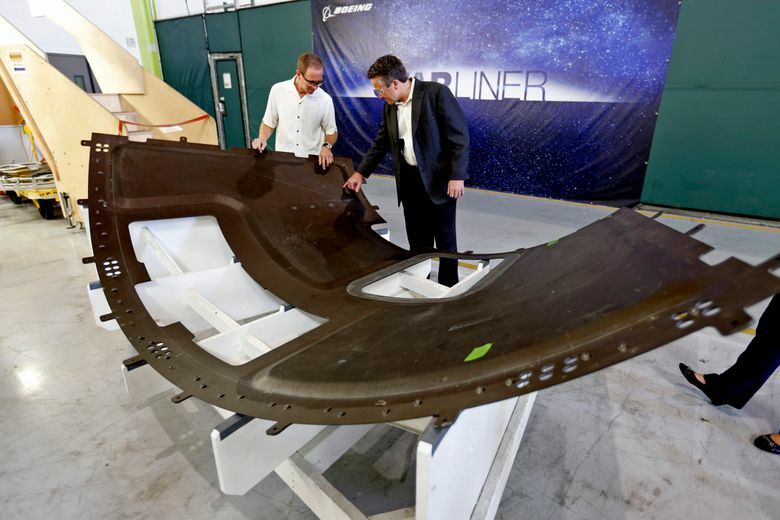 The Starliner’s base heat shield has an ablator, a proprietary material that absorbs energy on re-entry and only chars “like a marshmallow,” said David Schiller, leader of Boeing’s commercial crew aerostructures integrated product team. The base heat shield and its four backshells located around the crew vehicle are made of composite materials. A glass-phenolic honeycomb core is wedged between the composite layers, like an ice-cream sandwich, to provide high strength while staying lightweight. The entire vehicle is covered with thermal protection, including a type of woven ceramic “blanket” similar to the ones used on the space shuttle, and ceramic tiles on the backshells to deflect heat. Back then, the company, headquartered near Los Angeles, was still very young, so engineers looked at the legacies of the Mercury, Gemini and Apollo programs. The lessons are incorporated in its Dragon 2 crew transporter capsule, along with those learned from developing SpaceX’s Dragon 1 vehicle, currently used by NASA to take supplies to the space station. The Dragon 2’s abort system is a marked change from the capsule used in the Apollo program, which used a rocket on a tower located at the top of the capsule and was discarded on the way up to orbit. SpaceX’s launch-abort system can be used at any time during the ascent and stays on the capsule so it can be recovered on splashdown — part of the company’s emphasis on reusability, said Giger of SpaceX. The SpaceX capsule will also use more automation, such as its docking ability, to improve safety and allow the crew to focus on crucial tasks, Giger said. The company is also working on developing the capsule’s precision landing capability in the ocean so recovery crews can arrive within minutes. In the meantime, the capsule’s hardware is going through qualification testing and software is being developed and evaluated, said Garrett Reisman, director of space operations at SpaceX and a former NASA astronaut who flew on two space-shuttle missions.